A single mother struggling to earn a living starts her own business with her sister where they clean up crime scenes. Has a murder scene mess got you down? Are there bodily fluids and blood everywhere? Call Sunshine Cleaning for all your crime scene wiping and scrubbing needs! They are so thorough, you will never tell that a human was once brutally murdered there! Natural death cleanup also available upon request. "Sunshine Cleaning" is directed by Christine Jeffs, who has also directed films like "Rain" and "Sylvia," though "Sunshine Cleaning" is by far her best-known effort. It is written by Megan Holley, who has one other writing credit to her name with "The Snowflake Crusade." It stars Amy Adams as Rose, a single mother who is struggling to make ends meet working as a house cleaner. Her married police officer boyfriend Mac (Steve Zahn) tips her off that there is money to be made in the business of "crime scene cleanup" where people pay thousands of dollars to have murder scenes and houses where people have passed away washed up and spotless. Though she doesn't really know what she is doing, Rose hires her sometimes unreliable sister Norah (Emily Blunt) and starts her own crime and death scene cleaning business. Now, the two are forced to learn on the job as they navigate the dos and don'ts of cleaning up after the recently deceased. This is a darkly comedic film with just a touch of family drama. It can be quite funny (and simultaneously awful) to see these two women struggle as they scour and scrub crime scenes while being exposed to all kinds of bodily fluids and not wearing proper sorts of suits and protections. Amy Adams is wonderful in this movie, as she always is. She offers a very layered performance as she struggles to raise her son, has to cope with being "the other woman," must attempt to fake her way through starting a new business, and struggle to find confidence when facing old friends who are far more financially stable compared to her. Emily Blunt is great as well. She plays a character who lives with a chip on her shoulder and regularly disappoints those she cares about. Alan Arkin plays the patriarch of the two sisters and is very funny as a man always looking for an angle, trying to find ways to earn a quick buck like selling secondhand shrimp. 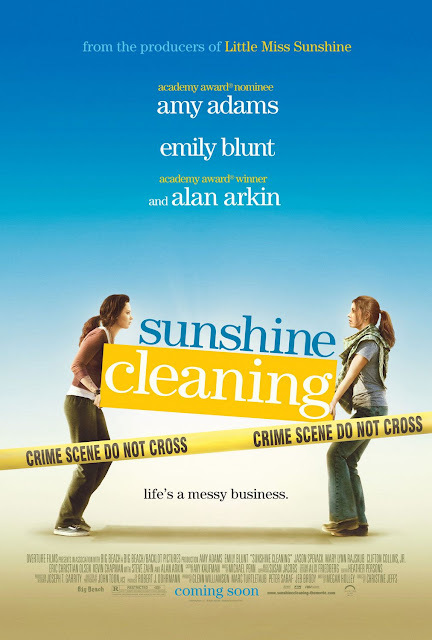 "Sunshine Cleaning" is a movie that's all about the characters. It gives the viewers a peek into the life of Rose and her family. We really enjoyed learning about them and spending time with them as the movie progressed. There are many moments of honest, bittersweet emotion, and we laughed on a reasonably consistent basis. This film's humor won't be for everybody since it deals with a darkly comedic, sometimes bloody and depressing subject, but for us, we very much appreciated the melancholy-but-witty nature of it.